The Yankees came into the 2015 MLB draft with the 16th pick and the 30th pick in the compensation round thanks to the departure of David Robertson. With uncertainties as to which direction the Yankees would go, the Yankees exited the first round drafting a pitcher and a shortstop. With the 16th pick, the Yankees drafted UCLA pitcher James Kaprielian whose pre-draft ranking was 21 according to MLB.com. Kaprielian’s repertoire consists of a fastball in the lower 90’s with a slider and curveball to go along with his best pitch, his changeup. Kaprielian’s ability to locate pitches is what makes him so effective as he’s lead the PAC 12 in strikeouts during the past two seasons with 108 and 114, respectively. He went 7-6 with a 2.29 ERA with 108 strikeouts to 35 walks in 106 innings in 2014 and 10-4 with a 2.02 ERA with 114 strikeouts and 33 walks in 106.2 innings in 2015. 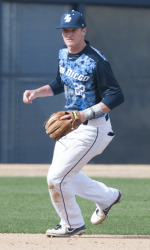 In the compensation round, the Yankees drafted University of San Diego shortstop, Kyle Holder with the 30th overall pick. Regarded as the best fielding shortstop in the draft with good range and a good arm, Holder was ranked as the number 51 prospect before the draft according to MLB.com. The 6’1” 185 pound shortstop is a left-handed hitter who needs to work on his “raw” hitting ability to become a legitimate prospect. The Yankees obviously believe in the kid’s ability to consistently put together good at-bats as his numbers over the past two seasons from an offensive standpoint have been pretty good. Holder hit .298 with 3 home runs and 29 RBIs in 52 games in 2014 while striking out just 16 times. He was even better in 2015 putting together a slash line of .348/.418/.482 with an OPS of .900. He hit 4 home runs with 31 RBIs and struck out just 19 times in 55 games. Although the Yankees may not receive rave-reviews for their first round draft picks, the team’s selections weren’t too shabby in my mind. As I stated on our twitter, baseball’s prospects are too difficult to project for one to get too upset about a team’s draft picks, so as fans, let’s sit back and hope and believe that the kids will make it! Positivity and optimism for the farm is something I am a strong advocate and the future of the Yankees from the farm’s standpoint is a lot brighter than it has been in year’s past. Follow the @BronxBomberBlog on twitter for more Yankees news, analysis, updates, live game tweets, MiLB updates, satire and all things Yankees!